Make cozy mittens in minutes with this versatile pattern! 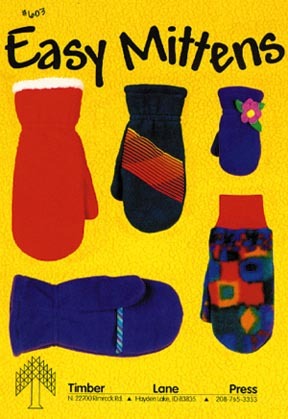 Choose basic mittens with wrist elastic, plus options such as the split palm that frees fingers, extra warm lined mittens, or knit cuffs for a snug fit. Add a personal touch with fabric or fleece trim. 7 sizes included with this pattern will fit the whole family, from Infant through Adult Large. Pattern by Timber Lane Press.